After an exhausting Christmas and New Year with all its shopping, feasting and partying, the Festival of Sleep Day on 3rd January might be a new cause for celebration, of which you may have been previously unware. 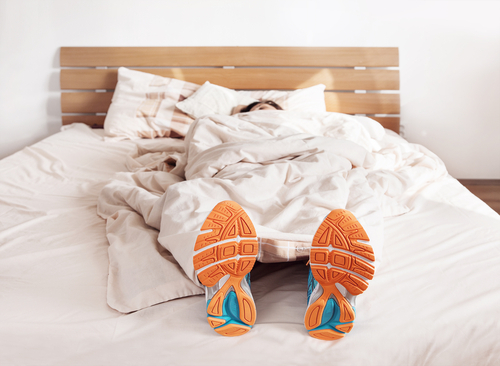 This unofficial holiday doesn't give you carte blanche to indulge in a duvet day or nod off over your desk if you're supposed to be back at work, but it does draw attention to the importance of sleep, which goes hand-in-hand with regular exercise, in keeping you fit and healthy. It enables the brain to form new pathways and consolidate memories, which improves mood, comprehension, concentration, productivity and performance in our waking hours. It is essential for the maintenance of physical health of the body, particularly in the healing and repair of cells. It helps regulate the balance of hormones in the body, such as leptin and ghrelin, which control feelings of hunger and fullness. Lack of sleep can lead to overeating and weight gain; if you're tired, you're likely to grab whatever quick snack comes to hand, make unhealthy choices and consume more calories than you need. Sleep also helps to maintain the correct level of insulin in the body. Sleep deprivation can upset this and as well as increasing your appetite, it creates health risks such as diabetes, stroke and heart disease. Deep sleep triggers the release of growth hormones, which boost muscle mass. I Sleep boosts the immune system to help fight infection and disease. Inadequate sleep can cause you to take longer to perform tasks, slow your reaction time (crucial if you're driving or operating machinery) and result in you making mistakes or forgetting things. So, how to make sure you get the 7 to 9 hours sleep each night that the Sleep Foundation recommends is necessary for the average adult? Make sure you incorporate exercise into your daily routine. Exercise promotes tiredness and that in turn, promotes sound sleep. Even light exercise like a 10 minute walk improves sleep quality. Try to stick to a regular bed-time and get up at the same time every day. Keeping to a routine is helpful in getting you into sync with your natural sleep/wake cycle. Limit caffeine and avoid alcohol before bedtime - both will interfere with your sleep. Don't eat heavy meals and rich food late in the evening and avoid too many refined carbs and sugar during the day. These can trigger wakefulness at night and disturb your restorative sleep pattern. Spend as much time as possible exposed to sunlight during the day but avoid bright screens from computers, tablets and TVs within an hour or two of bedtime. The blue light they emit suppresses melatonin, the sleep-inducing hormone. And keep your bedroom dark and comfortably cool. If you have trouble relaxing, take a warm bath, read a soothing book or listen to some soft music. If all else fails, you could take the advice of the founder of the scout movement, Robert Baden-Powell, "Living indoors without fresh air quickly poisons the blood and makes people feel tired and seedy when they don't know why. For myself, I sleep out of doors in winter as well as summer. I only feel tired or seedy when I have been indoors a lot. I only catch cold when I sleep in a room." Well... maybe not in the UK in January!